The Vancouver Condo Buzz » EXCITING Downtown Vancouver Maddox Condo Tower Launching! Cressey Introduces the Yaletown Maddox Vancouver Condos for Sale Rising 37 Storeys! Affordable downtown Vancouver Maddox condos are coming soon and brought to you by award winning builder, Cressey Development Group. Maddox by Cressey is all about place, form and trust. As the marketing says, Maddox Vancouver condo tower is a prestigious downtown residence that is uniquely situated at the centre of Vancouver real esate’s best connected neighbourhoods, including the much beloved Yaletown district. Rising 37 storeys on the corner of Howe and Drake, the downtown Vancouver Maddox condo tower has a uniquely slender shape and innovative use of materials. In addition to becoming one of downtown Vancouver real estate’s landmark condominium towers, the Maddox condos for sale will present interiors that are forward thinking with great specifications and details that are merged with functional space planning to create a memorable, livable and affordable downtown Vancouver condo home for buyers. Also as marketed, the world class location in a world class city makes the centrally located Maddox Vancouver condos for sale so much better than any other offering. Located at Drake and Howe street, the prestigious downtown residence is close to The False Creek Waterfront district, trendy shops and restaurants in Yaletown, Granville Island and the downtown entertainment district. At Maddox Vancouver condos, ocean and mountain views will be part of your new lifestyle. The iconic landscape of Vancouver is within reach, right from your living room. Perfection in architecture, design, interiors, functionality and floor plans is very hard to come by, but at the downtown Vancouver real estate development at The Maddox, you certainly come as close as you can. The slender shape of the tower coupled with the innovative materials used in both the exterior and interior make this a truly unique tower that is connected to all that the community has to offer. The Maddox Vancouver downtown condo tower represents the new standard in building design. With the highest environmental standards, The Maddox Yaletown condos will provide the best year round comfort in living with geothermal and forced air climate control technologies for heating and cooling. Intelligent floor plans are both functional as well as spacious. One of the best features we believe is that The Maddox Vancouver condos for sale are brought to you by a builder with an admirable legacy in the Cressey Development Group, who were the builders for the Donovan and Elan in Downtown Vancouver real estate market. Currently accepting registrations, please express your interest by calling 604.669.8200 or by visiting www.maddoxdowntown.com today. The Maddox Vancouver condo building is not your standard downtown high-rise building at all. The goal from the architects and designer’s point of view was to create something different, something layered but distinctly simple. The innovative clay panel system technology that graces the façade of this modern form at the downtown Vancouver Maddox condos for sale is very durable and efficient and allows for better insulation of heat during the winter months and provices less solar heat into the residences. There are also state of the art rainscreen technology incorporated into the building design at the new Maddox Vancouver condos for sale. The visual prescence of concrete is minimized as the floor to ceiling glass panels become the dominant structural element. This highlights the downtown Vancouver Maddox condo high-rise’s varying building elevation which gives it a clearly slender and clean curb appeal that is designed for the ages. The new standard in comfort is also designed into the new Maddox Vancouver condos for sale with LEED standards that create year round comfort for residents. Energy efficient forced air heating and cooling technology in addition to large outdoor spaces have been created for you in mind. The careful detailing and impressive designs of the interiors at the Cressey Maddox Vancouver condos for sale are the selling features of this landmark tower. Here, you will find tall and slender designs with clay panel systems providing a timeless façade with exceptional solar performance and green features. With LEED standards fulfilled, the Cressey Maddox condos will be energy efficient and will provide cooling and heating for all suites in addition to smooth painted ceilings with low VOC paints. Other interior features include two colour schemes called Panna or Grigio as well as engineered wood floors throughout the dining, living, entry and kitchens (and some floor plans and suites allow for hardwood in the bedrooms as well). The pre-sale Vancouver Maddox Condos for sale will also introduce large format porcelain tiling in the dens and laundry with energy efficient stacked washer and dryer in addition to 100% wool carpets in the bedrooms in some homes. There are custom roller blinds as well as wood grained entertainment built in with combination storage and open shelving in select Maddox Vancouver Downtown condos for sale. Residents at The Maddox Tower will also enjoy an onsite fitness centre with change rooms, business centre, a Maddox Rooftop Social Lounge that contains a media centre, kitchen, patio and outdoor children’s playground. The spa inspired bathrooms at the luxury Vancouver Maddox condos will include marble counters, wood grained floating cabinetry by Armony Cucine as well as designer chrome sink faucets and contemporary rain shower. There is luxurious marble floors a well as fresh white ceramic tile tub. Please note that the ultra luxury Vancouver Maddox Platinum Collection of suites have upgraded features that include a Control 4 home automation system, engineered wood flooring in all living areas, larger integrated stainless steel appliance set, 48 bottome wine cooler, extra capacity dual basin stainless steel sinks and more. The Maddox Platinum Collection in the downtown Vancouver real estate market also includes radiant in floor ensuite bathroom heating as well as built in closet organizers and luxurious rain shower heads in the shower. Cressey is well known for their high-end interior design of new multi-family housing. Here at the downtown Vancouver Maddox condo high-rise, residents will enjoy the Armony Cucine, featuring functional Cressey kitchen spaces that are chef inspired and perfect for you. Introduing Armony Cucine at Maddox Vancouver, from the north eastern section of Italy, facing the beautiful Adriatic Sea. Armony Cucine by Cressey kitchens is known mostly throughout the European nations for combining minimalist lines, prestigious high-end and luxurious materials as well as contemporary colours. Functional and simple, the Cressey Armony Cucine kitchens at the new Maddox Vancouver Downtown Condos for sale featured refined entertainment and cooking spaces that are engaging, beautiful and elegant. With the perfect balance between technical precision and minimalist design, the downtown Vancouver Maddox Armony Cucine kitchens are also stable and durable for long term value. Also named the Cressey Kitchens, Vancouver homebuyers can expect to find amazing Armony Cucine cabinets from Italy as well as a Fagor 5 burner gas cooktop, integrated Fagor wall oven and built in dishwasher. Other appliances include integrated stainless steel microwave and Blomberg bottom freezer fridge as well as a high capacity Faber slide-out hood fan. There are soft closers on all drawers as well as task lighting. The Cressey kitchens at the new Maddox Vancouver Downtown condos for sale will also feature polished aluminum bottom panel base in under sink cabinetry as well as wood grained cabinets in Grigio or Panna. The kitchen counters will have seamless quartz or granite and there are single bowl stainless steel sinks. As someone who has expressed interest in a previous Cressey community, we would like to invite you to register for our newest community coming to downtown Vancouver real estate market, Maddox. Our desire with Maddox Vancouver condo tower is to design and build an architectural landmark that brings together the elements of Place, Form and Trust to acknowledge what’s more important to you. To learn more about Maddox Vancouver Downtown condos opening this spring, register at www.maddoxdowntown.com. Regards, Cressey Development Group. Located on the corner of Howe and Drake, Maddox Vancouver Downtown condos for sale is a prestigious downtown residence centrally positioned to take advantage of some of Vancouver’s best neighbourhoods. Easy access to the seawall & False Creek waterfront, Yaletown, Granville Street, Granville Island, English Bay and minutes across to South Granville and Kitsilano make Maddox ideally situated. This Downtown Vancouver real estate location also lends itself to stunning city, water and mountain views which after all, is one of our favourite things about Vancouver. Maddox Vancouver Downtown condo tower will rise 32 storeys in a slender and punctuated formation where each side is unique and boutique homes have been placed to take advantage of those gorgeous views we just spoke of. A beautiful clay panel system adds interest and function on the exterior, while energy efficient heating and cooling provide earth friendly comfort. Inside, the evolution of the Cressey kitchen at the new Maddox Vancouver condo tower provides new and exciting materials with functional spaces and conveniences. We have a wide variety of home styles ranging from 498 to 1,576 sf including our Vancouver Maddox Platinum Collection. Maddox opens this spring! We will bring the best of our 40 years of experience to building Maddox Yaletown Vancouver Dowtown condos, because we know that trust is paramount when choosing your next home. For over 40 years, Cressey has been providing superior design and quality construction to our homeowners. We have won numerous awards over the years and we strive to continously improve and learn new technologies to better the living experience. From Olive and Mantra, to Elan and Donovan, Maddox Vancouver Downtown Condos is the latest addition to the Cressey Vancouver family. Cressey introduces the Vancouver Maddox Yaletown Condos! Meet Maddox Yaletown Condos for sale – Cressey is excited to announce a new community coming to downtown Vancouver real estate market, Maddox! Maddox Yaletown – Place, Form and Trust. The new Yaletown condos at downtown Vancouver Maddox brings together the philosophies of great place, form and trust to create a new living experience. Maddox Yaletown condos for sale is a prestigious downtown Vancouver real estate project, centrally positioned to take advantage of some of Vancouver’s best neighbourhoods. Easy access to the False Creek waterfront, Yaletown, Granville Island, the entertainment district, and minutes to South Granville and Kitsilano, make Maddox Yaletown condos for sale ideally situated. Best of all, this great “Place” lends itself to stunning city, water and mountain views which after all, is one of our favourite things about Vancouver. The Downtown Vancouver Maddox “Form” will rise 32 storeys in a slender and punctuated formation, where each side is unique and homes have been placed to take advantage of the views. A beautiful clay panel system adds interest and function on the exterior while geothermal heating and cooling provides earth friendly comfort. Inside, the evolution of the Cressey kitchen continues with new and exciting materials while offering functional spaces and conveniences. We have a wide variety of downtown Vancouver Maddox floorplan styles ranging from 498 sf all the way up to 1,576 sf. Maddox is opening this Spring 2011! The new Vancouver Maddox condo tower is designed and built by the same Cressey team which brought you James False Creek which means you can expect and “Trust” in the same high quality. From Olive to Mantra, Elan, Donovan and James, Maddox Yaletown Vancouver condos for sale is the latest addition to the Cressey Vancouver family. Register today! For more information on Cressey’s newest community, Maddox Vancouver condos for sale, please register online at www.maddoxdowntown.com. > The Downtown Vancouver Maddox Condo Tower is 32 storeys and 215 homes. > 1 Bedroom, 1 + Den, 2 Bedroom, and 2 + Den homes plus Penthouse floor plans. > Maddox Vancouver high-rise has stunning water, city and mountain views. > Air Conditioning, parking and much more! > We also have a spectacular Vancouver Maddox Platinum Collection on the upper levels with additional features. > The luxury Vancouver condos are designed and built by Cressey, a builder with over 40 years of experience. > Amenities include Maddox Social Lounge with kitchen, media, rooftop patios, children’s play area as well as large lobby, fitness centre with steam room and business centre. 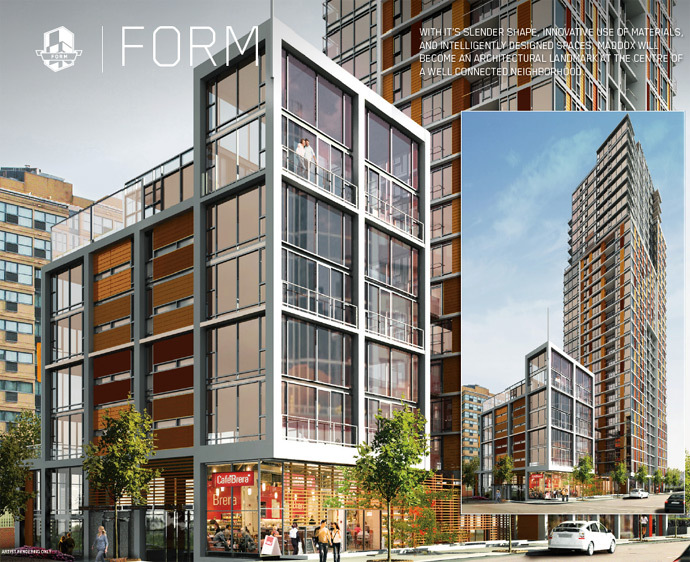 > Maddox Vancouver condos completion is tentatively planned for Fall 2013.